In this post I would like to compare the UF-6400 Mass Driver and the Oculus Beam Array. At first glance, the different might not seem all that great, but when you dive into it, you see that they behave quite differently in a manner, that might seem non-intuitive at first. This also server as my case against using “average damage” as an indicator of weapon performance and why I think you should instead look at “probability of destroying / crippling” as an indicator, especially against small ships. First, we shoot at a UCM frigate with the UF-6400 railgun and the Oculus Beam Array and investigate the average damage. So both cause an average of two damage. We know this will cause a crippling damage which has 6/9 chance of causing at least 2 further damage, destroying the ship. The two weapon systems are equally good a killing UCM frigates. I have 6/9 (66,7 %) chance of destroying the frigate – I should cause the average damage and then it is all about the crippling roll. If I fire two such weapon systems, statically speaking, it should be destroyed. If not I am really unlucky. All of these statements are wrong or grossly misleading and stems from the fact that statistics and probabilities are damned hard to grasp. For an average to be telling, I assume that I perform the test / action many, many times. So if I had to cause a 100 damage, average damage was a good indicator of performance because the occasional good roll would be evened out by the occasional bad roll. But when I only go through the test / action once or twice, chance plays a big role. I have to look at the probabilities of achiving different outcomes to get a better idea of how the weapons perform. What is the chance of one-shotting the frigate? I will calculate the probability of each individual outcome of the dice and if I pass the threshold for crippling damage I will calculate the probabilities coming from that. In the end, that will give me the probability that I cause sufficient damage to destroy the frigate outright and the probabilities for different damage amounts. You notice, that the Oculus Beam Array have an increased chance of 4 and 0 damage and decreased chance of 1 and 3 damage compared to the UCM Mass driver. 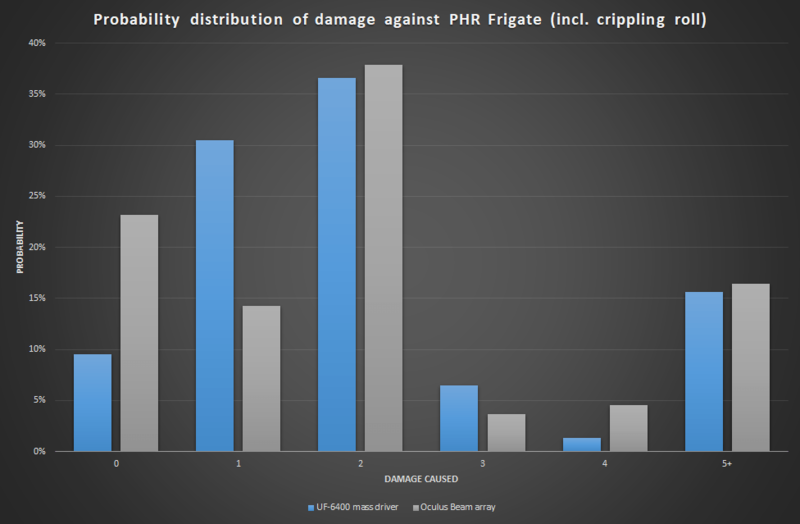 This becomes especially important for increasing the probability of outright killing the frigate since 4 damage against the Frigate is an outright kill, whereas 2 and 3 damage relies on rolling the right crippling roll. 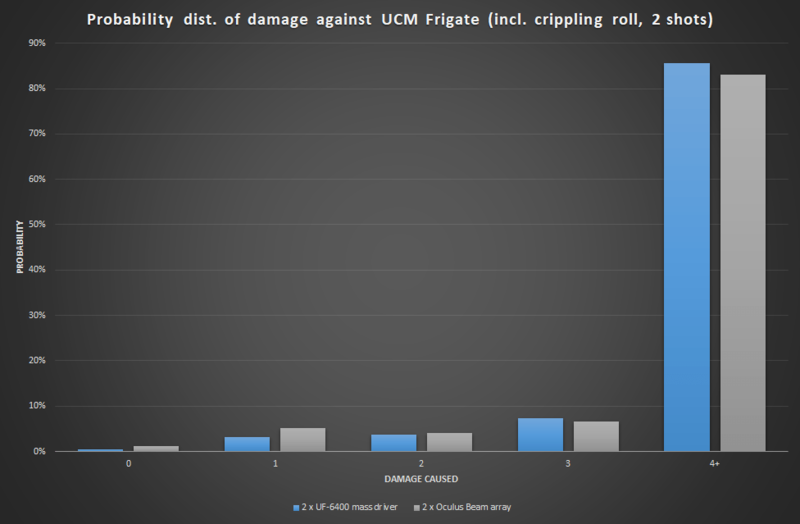 What is interesting here is really the 4+ damage bracket which is the “frigate is destroyed” part. Translated to numbers this equals 47,9 % for the mass driver and 51,6 % for the oculus beam – or 7,7 % greater chance of outright destruction. So lets adress statement 1 and 2 above. The two weapons are not equally good. The oculus beam is better than the mass driver in this specific case. They might have the same average damage, but the oculus beams have a significanty increased probability of 4 critical hits which are instantly deadly, increasing the chance of doing 4 or more total damage. Second, 66,7 % chance of killing is not correct. It is just around 50 %. Actually, with the UCM mass drivers you have less than 50 % chance. So not killing it is not unlucky – it is actually rather likely. So what about shooting it twice? Let’ look at that case. Unsurprisingly, it is a bit hard to read since it is overwhelming likely that the poor frigate is dead. There is 85,5 % chance for the UCM mass drivers and 83,0 % chance for the Oculus Beams. So to adress the third question; Obviously, destruction is not guaranteed. Actually, 85 % chance is not even that great – it is approximately 6 times out of 7. Likely, yes, but far from something where the term “unlucky” really applies if you fail, in my opinion. Another interesting observation is that now the UCM mass drivers perform better. Why? Well, the oculus beams are basically more of a gamble. The extreme results are more likely. 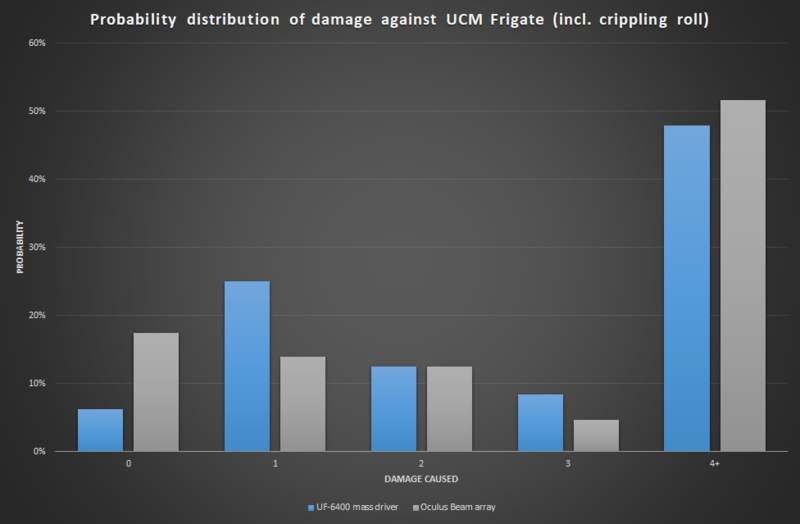 But an increased chance of 8 damage before critical (it is almost 3 times more likely for the Oculus Beams than for the UCM mass driver) makes no real difference, while the correspondingly increased chance of 0 damage makes it considerably more likely, that no damage is caused. In short; the increased winnings in this gamble is useles, but the increased loss is felt. As a final experiment, let’s fire at the PHR Frigate – the hardest nut of them all (in the frigate category, at least). As you see, the Oculus Beams are still better, though only by about 5,5 %. But you also see a significant increase in the chance of 0 damage – as before, we see that the extreme cases are more likely with the Oculus Beam. There are three lessons I would like to draw from this. An Oculus Beam is more of a gamble than an UCM mass driver and for that reason, a single salvo tend to perform better against small targets. However, the more times you fire at a target, the more the stability of the mass drivers show itself and becomes better, though the difference will become smaller and smaller. Average damage is a misleading measure. It can give you an idea, but it can also mislead you, especially with small samples. I have used average damage a lot on the blog, but I am always keenly aware of it’s limitations. However, the challenge about using probabilities are, that to get a single figure, I need to decide what I’m aiming for. The simple choice is “destruction” but in some cases that is either impossible of very improbably (like firing a supernova laser at a frigate), not really showing the full picture. Statistics are not intuitive. Just to elaborate a bit on that; We’ve been looking at firing at an undamaged frigate. The oculus beam has a better chance of outright destruction, but in the long run, the UCM mass driver is better. But what happens if I fire at a frigate that has already suffered 1 point of damage? You might think the picture is the same, but it is not. 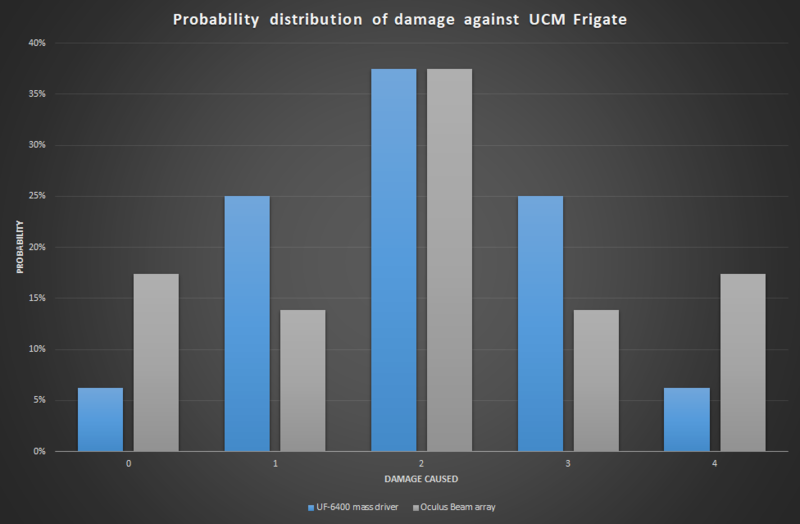 I’ll spare you the math and just say, that the UCM mass drivers are actually better than the Oculus beams having about 9,1 % greater chance of destroying the frigate outright (54,1 % to 59,0 %). I will do a bit more of probability calculation in the future, but I will also use average damage a lot – in many cases, the picture it paints will be sufficiently accurate to convey the point.